The physician’s highest calling is to help suffering people. If helping people is your calling, then this is the job for you. Whether you work at a public or private hospital, being a physician has many perks due to the prestige that comes with this career. High-level healthcare professionals are worth their weight in gold. This profession has a high salary, thus, if you decide to have such a career, you will not only save lives, but you will also always have money to pay the bills. A good, detailed CV is vital for a medical specialist. Thus, if your medical CV looks like a list of things you’ve done, it is better to ask for from experts. Meanwhile, focus on learning contracts, medical licensing requirements, CME allowance, and other regulations. Our writing consultants have been helping people with writing their CVs for five years. Hundreds of happy customers from the medical industry who have gotten jobs thanks to our assistance have provided us with positive feedback. Our professional CV writing service experts know that your time is valuable; that is why our medical resume writers do each project fast and accurately. You can place an order, and rest assured that everything will be done on time for an affordable price. We know exactly what our customers need, and we know the current situation in the labor market. With this knowledge in mind, we can compose a winning resume so that your potential employer will realize that you are a talented professional. I wanted to get a job at a new firm, but I didn't have any time at all to write up a new resume and cover letter, because I was working 10 to 12 hours a day. My wife told me about CraftResumes, and after speaking with them via Skype, they sent me a CV, resume, and portfolio. Now I have a new job at a smaller firm in rural Georgia where I'm not working as hard, and I have more time to spend with my family. Who will work on my CV/Resume/Cover Letter/LinkedIn? All members of our writing team have a relevant degree and wide experience in medical CV writing. Our specialists create each project with the help of the keyword strategy. This technique is based on carefully selected keywords for every job, which makes your resume extremely effective. All of our employers have received certification from PARW/CC. I have just graduated, and I want to start my medical career. Where should I begin? Having your resume and cover letter done is the first step you should take when starting to climb your career ladder. If you don’t know how to do it yourself, get writing help from experts who can do an outstanding piece of proper writing. 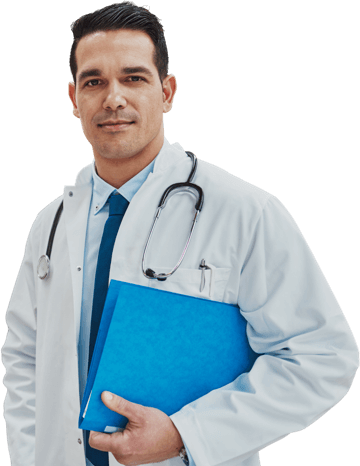 What is included in the price of physician resume writing service? An interview with our professional resume writer, where you discuss all the details. In-depth analysis of current open positions, concerning the niche you have chosen. Writing, resume editing, and double-checking of your order. If you have any problems, our customer support representatives are there to assist you 24/7. What will happen if I do not like the result? The writing process starts with an interview with your medical writer for you to understand better how your resume/CV/LinkedIn page will look like. We do everything possible for our clients so that they get the job they want. But, having your CV and cover letter done is only the halfway point on your road to success. The rest depends on you.